With the multitude of children’s books published every year, it is often difficult for a new book to stand out, especially one that doesn’t feature licensed characters from television or other media. 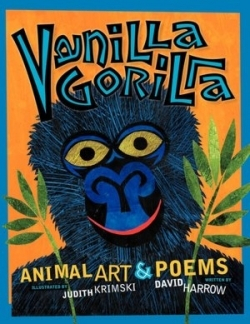 Vanilla Gorilla: Animal Art & Poems does stand out because it’s that good. The book’s format is simple: a page of illustration facing a page of rhyming text with each set focused on a particular animal. The selection of animals—familiar favorites like the crocodile, chameleon, sea horse, and dragonfly, plus more exotic animals like the fanaloka, Portuguese man o’ war, and aye-aye—is varied enough to keep any kid (or adult) interested. In fact, it is hard to believe any animal lover wouldn’t find some new and interesting fact here. The variety also provides Judith Krimski, an award-winning graphic designer and illustrator, with opportunities to show off her brightly colored style of collage art that might be described as a more organic-looking Eric Carle. Vanilla Gorilla offers a perfect balance of art and text, education and fun, and is a wonderful find for any adult or child. Readers will surely hope that Harrow and Krimski have more animal art and poems to come.